Cruising Association Lobster Pot Campaign. Poorly marked lobster pots and fishing gear are the most difficult and unpredictable hazards facing the coastal cruising fraternity. Fishermen too report the loss of expensive gear as a result of entanglements. These encounters can even be life-threatening. In one year alone the RNLI has dealt with 295 incidents of fouled propellers. Many incidents go unreported, as shown by the tales of close encounters that have poured in to the Cruising Association (CA) during 2017, possibly a fraction of the actual number. Therefore the CA hopes to secure a government consultation about the effectiveness of the current guidance and the merits of enforceable regulations for the whole of the UK. 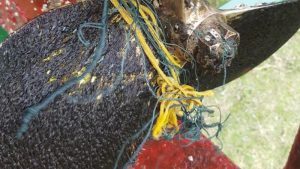 The Cruising Association’s campaign to improve small craft safety by securing the better marking of lobster pots, goes from strength to strength. Judith Grimwade, CA President, commented: ” We believe we have established that something needs to be done about badly marked gear and that the wider boating community strongly supports what the CA is trying to do.